Dr. Shakil Afridi, who was sentenced to 30 years in prison on May 23 on charges of treason, is said to have helped the Central Intelligence Agency (CIA) of the United States track down bin Laden by collecting DNA samples from selected residents in the cantonment town of Abbottabad. Bin Laden was killed in a U.S. raid on his secret residence in Abbottabad in May 2011. Afridi was arrested by Pakistani authorities three weeks later, leading to friction between Islamabad and Washington. Médecins Sans Frontières, the international medical aid charity, had then warned that the CIA's alleged use of a vaccination programme as cover to spy on bin Laden threatened immunisation work around the world. Afridi’s role appears to have exacerbated suspicions among people in the Federally Administered Tribal Areas (FATA) that polio vaccinations are part of a U.S. conspiracy to render their children infertile. 'The problem of refusing vaccination is not new but Afridi's fake vaccination campaign has proved to be a setback to our efforts to popularise immunisation,' Dr. Rekhanullah Khan, a polio officer in the FATA, told IPS. This year, Pakistan has already recorded 22 cases of polio with 10 of them from the FATA, a territory consisting of seven tribal agencies. 'In the FATA, authorities are facing difficulties reaching children of immunisable age,' said Dr. Javid Khan of the World Health Organisation (WHO). 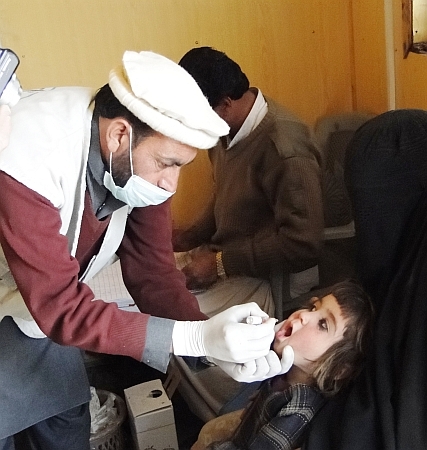 'In the Khyber Agency of the FATA, which recorded its eighth case last week, oral polio vaccines have not been administered since October 2009, leaving some 150,000 children vulnerable,' Javid Khan told IPS. 'This is a programme by the U.S. to cut the population of the Muslims and weaken them to a point that they become incapacitated to defend Islam,' Qari Mohammad Akram, a resident of FATA’s Bajaur agency, told IPS over telephone. 'People here don’t want any treatment for a disease that has not affected them. We need to follow teachings of Islam and heed the Prophet,' he argued. Refusal to cooperate with health authorities is also because FATA residents are demanding a better deal from the central government. 'Last week, parents refused to allow vaccination in South Waziristan agency, saying they would prefer to have electricity, paved roads and clean drinking water first,' Dr. Muhammad Khalid of the expanded programme on immunisation (EPI) in the FATA, told IPS. The ‘Dawn’ English language daily, published from Karachi, quoted Dr. Elia Curry, leader of the WHO’s polio eradication section in Pakistan, as saying on Jun. 9 that the virus will continue to circulate as long as anti-polio drives miss significant numbers of children. Curry told Dawn that environmental surveillance, covering sewer systems, had proved persistent circulation of wild poliovirus in cities like Lahore and Rawalpindi with children in the provinces of Punjab and Khyber Pakhtunkhwa particularly vulnerable. According to WHO’s website, the Khyber Agency is the only area in Asia having both the wild poliovirus-1 and wild poliovirus-3 types and this poses a threat to efforts at polio eradication in the country as well as globally. WHO officials said there was added risk of the virus spreading from the FATA to other parts of the country because of the ongoing large-scale population migration to other parts of the country. An immunisation drive begun in selected areas of Pakistan on Jun. 4 is expected to reach at least 17 million children, but would still miss children in the FATA because of military operations against the Taliban in several areas, particularly the Khyber Agency. Some parents are convinced that unsettled conditions in the FATA are mainly responsible for polio continuing to threaten their children. 'Both the army and Taliban are responsible for making my daughter crippled,' says Allah Noor, whose 21-month-old daughter, Salma, was diagnosed with polio on Jun. 1. 'Obviously vaccinations cannot be carried out when fighting is in progress and the health facilities are closed,' Noor, a resident of Usai Khula village of the Khyber Agency, said. 'I want to tell all parents to cooperate and save their children from vaccine-preventable ailments,' he told IPS. In early April, the WHO had requested Khyber Pakhtunkhwa’s provincial government to carry out mass immunisations in the Jalozai refugee camp, home to 40,000 children uprooted by military operations in the FATA. On WHO’s request, Dost Muhammad Khan, chief justice of the Peshawar High Court, ordered the setting up of transit points to vaccinate children fleeing military operations in the FATA’s Khyber Agency and reaching the Jalozai camp. 'We established 48 vaccination points where children coming in from the Khyber Agency are being vaccinated,' Dr. Jan Baz Afridi, who heads the EPI in Khyber Pakhtunkhwa, said. In 2011, Pakistan emerged as the worst polio-infected country in the world with 198 cases and this year will be no different if urgent measures for mass immunisation are not taken, according to WHO officials.